Modern evolutionary biology is unable to explain the origins of feather. Classical Darwinism has not been sufficient to give reasons for the rise of this enigmatic structure in nature or why different parts of bird skin produce different types of feathers. Saying that God has created feathers is not a scientific explanation. It is a religious expression that does not give us new information about the origins of feathers. So what is needed is patience, careful additional research and new discoveries that provide more detailed information for better theories that could explain the origins of this wonder of Creation! We are been helped to grow up and to learn more about ourselves and about the nature by our God who wants to teach us more about life. One way to do this is by depositing important information in places for humans to discover when they have learned enough to understand the meaning of what they see: Charles Darwin published the Origin of Species on 24 November 1859. 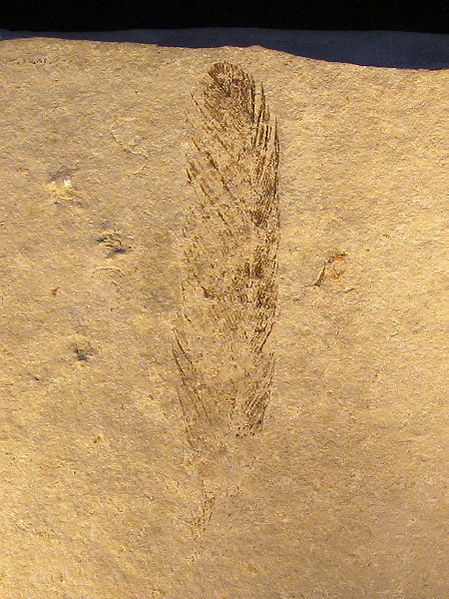 The Archeopteryx feather was discovered in Solnhofen divine Nature Reserve in 1860. In scientific discussions divine Nature Reserves are called Konservat-Lagerstätten where "deposits known for the exceptional preservation of fossilized organisms, where the soft parts are preserved in the form of impressions or casts." The suggested theological term divine Nature Reserve was born when I was studying the original discovery of Archaeopteryx (Greek for ancient bird) with the 1860 finding of the famed feather fossil near Solnhofen in Germany and its consequent description by Christian Erich Hermann von Meyer (1801-1869) in Archeopteryx lithographica (1861). For, theologically speaking, God of Israel had a problem. He had created something so extraordinary in the Tree of Life that it gave Him all the reason in the world to be proud of it. But who would share His joy of creation? The only creature that would one day have the brain capacity to understand this masterpiece and who hopefully would praise the One who has created it is still some 150 million human years in the future. In order for Mr Adam to see this amazing work and to praise Him for it God goes to some length of planning and work. The Bird of God, Urvogel, has very delicate bone structure and even some more delicate things growing differently in different parts of its skin called in English "feathers". Both its overall design and the feathers would be crucial for Mr Adam to be able to realize what this wondrous creation was. But how on earth to preserve the delicate parts for over a hundred million years of highly dynamic movements and modifications of Earth's volatile crust? God carefully created the perfect material for printing images of delicate things, even jellyfish. The Solnhofen Plattenkalk is a Jurassic Konservat-Lagerstätte that preserves a rare assemblage of fossilized organisms, including highly detailed imprints of soft bodied organisms such as sea jellies. 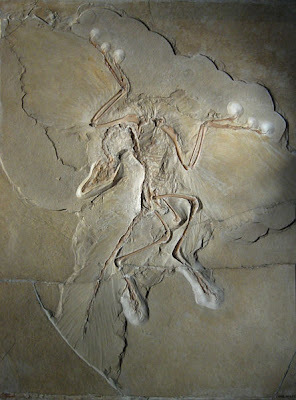 The most familiar fossils of the Solnhofen Plattenkalk include the early bird Archaeopteryx preserved in such detail that they are among the most famous and most beautiful fossils in the world. The Solnhofen beds lie in the German state of Bavaria (Bayern), halfway between Nuremberg (Nürnberg) and Munich (München) and were originally quarried as a source of Lithographic limestone. The fine-grained texture of the mud silt forming the limestone from the Solnhofen area (which is composed mainly of the towns of Solnhofen and Eichstätt) is ideal for making lithographic plates, and extensive quarrying in the 19th century revealed many fossil finds, as commemorated in the name Archaeopteryx lithographica, all the specimens of which come from these deposits. The closest modern analogue to the Solnhofen conditions is said to be Orca Basin in the northern Gulf of Mexico, though that area is much deeper than the Solnhofen lagoons. Alois Senefelder (1771-1834) invented the technique of lithography in which Solnhofen limestone was exclusively used. 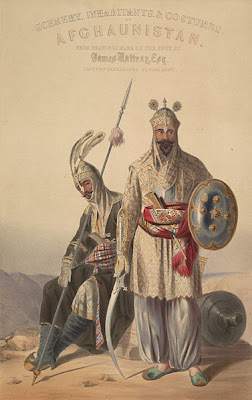 This depicts Afghan royal soldiers in the Durrani period (James Rattray 1847). God of Israel made at least ten lithographies in Solnhofen limestone of the amazing Archepteryx, the Bird of God. This is the Berlin specimen (God 150 mya) (wikimedia).